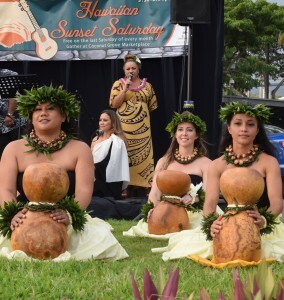 Residents, visitors and families of all ages are encouraged to mark their calendars for the last Saturday of every month and plan to attend the free Hawaiian Sunset Saturdays. This once a month community event celebrates Kona’s spectacular sunsets with live Hawaiian music and hula starting at 5:30 pm on the lawn at Coconut Grove Marketplace. Everyone’s invited to bring lawn chairs, beach blankets and enjoy beautiful live Hawaiian music under the sunset sky. Lovely hula dance completes the evening. When the sun sets and the music is over, enjoy a stroll on Alii Drive, and check out the many food venues. Hawaiian Sunset Saturday happens on the last Saturday of very month. Hawaiian Sunset Saturday is proudly brought to you by Kailua Village Business Improvement District, KTA Super Stores, Current Events, Kona Commons, On The Rocks, Courtyard Marriott King Kamehameha Kona Beach Hotel, huggo’s KBXtreme, Body Glove Cruises, Brewery Block and Hawaii Tourism Authority. Browse the Event archive. Event Categories: Events, Special. Bookmark the permalink. Trackbacks are closed, but you can post a comment.